Tuberculosis spondylitis. 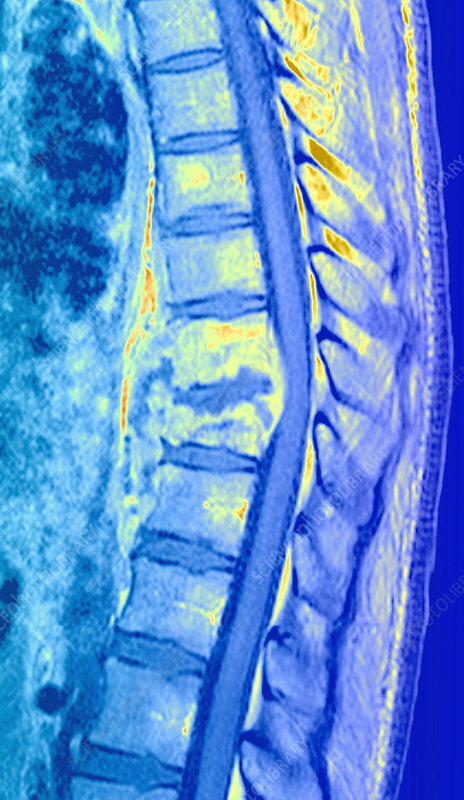 Coloured magnetic resonance imaging (MRI) scan of a section through the thoracolumbar spine of a 42-year-old patient with tuberculosis spondylitis (Pott's disease), showing the vertebrae compressing the spinal cord (centre). Pott's disease causes the softening, collapse and inflammation of vertebrae. It is a secondary disease to tuberculosis (TB) and is caused by the Mycobacterium tuberculosis bacteria moving from the lungs to the spine.